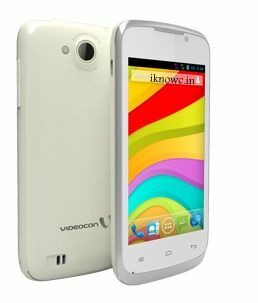 Videocon A31 the latest Dual core smartphone from the company is now listed on the official website. The specifications and features would become more impressive if the device will be launched under the price of RS 7,000. There are many new smartphones that are listed on Videocon official Website but the company has not launched even one of them officially, well who knows why. The specs the A 31 are similar to Videocon A48. The handset will compete with Spice Mi 436, Karbonn A8, Spice Mi 492 Stellar Virtuoso Pro+, Micromax A76, Celkon AR45 and Intex Y5. Overall the device comes packed with fair features. The handset comes with 4 inch capacitive touch screen having resolution of 800×480 pixels. The A31 has 1.2GHz dual-core processor joint with 512MB of RAM and runs on Android 4.2.2 Jelly bean operating system. Videocon A31 packs with 5MP camera rear accomplished with LED flash and 1.3MP front facing camera with video calling support. The mobile phone offers access to DUAL SIM card slots, 4GB ROM internal memory and micro SD card slot (32GB). App like Hungama, Opera Mini, history eraser, Fun Zone, Google news and FOTA comes pre loaded in the handset. The smartphone features 3.75G, Wi-Fi, Bluetooth v 4.0 with A2DP support, micro USB and GPS/A-GPS. The Videocon A31 comes in white and black colors. The Price of the handset is not revealed yet, the device will be available as soon as the company launch it.